Quit often enough in Halo: Reach, and you might find yourself unable to play at all. Anyone who plays videogames online probably has had some kind of experience with people quitting. Perhaps you suddenly find yourself outnumbered three to one as members of your team drop out in Gears of War, or maybe you're denied a win in Street Fighter 4 as your opponent vanishes in a puff of internet smoke just before you strike the final blow. 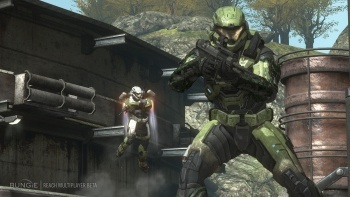 But if you make a habit of quitting games in Halo: Reach, you might be in for something of a surprise. Bungie's Brian Jarrard says that people who habitually quit online games create a "really negative experience" for other players and that while quitting isn't cheating in the strictest sense, Bungie is still eager to curtail it as much as possible. He said that Bungie had developed tools to detect quitters and that it wanted to "remove them from the population" so that they couldn't spoil anyone else's fun. While few would argue that people quitting online games isn't irritating, actively removing them from playing online seems a touch heavy handed, as well as difficult to manage. One would have to assume that Bungie's tools take into account things like connection issues and other legitimate reasons that people might abruptly leave a game, but no tool is foolproof and there will almost certainly be mistakes. Without seeing the system in action however, it's hard to say anything for definite.